In 1872 French sailor Pierre Loti visited the desolate Pacific island of Rapa Nui. Descriptions in his diary and drawings were published and received great public interest. Here were all the ingredients to satisfy nineteenth century ideas of the exotic: remote, tropical, cannibal inhabited, strange rituals and frenzied dancing, and in addition – the ruins of an ancient and unknown civilisation. But Loti had visited the island almost at the end of its occupation by its indigenous people. The large stone statues had not been erect for some time, even though he recorded them as being so, and its population had been decimated. So Loti’s graphic and written descriptions were embellished for his audience, a fact that is almost as interesting as the real fate of Rapa Nui. Rapa Nui, previously known as Easter Island, remains famous for its massive stone carvings which attracted great interest from as far back as the eighteenth century. The first travellers and nineteenth-century scientists who visited this remote place left written and graphic descriptions of life on it. The island’s culture was destroyed between 1860 and 1888 as a result of contact with such visitors and the consequences of slavery and deportation, European politics in Oceania, the imposition of Christianity on its inhabitants, the Pacific War between Peru, Chile and Bolivia, and the changes in anthropology and its relationship with non-Western civilization. Pierre Loti’s travel diary record of his visit to Rapa Nui in 1872 bore witness to the end of the island’s culture, which he described as the logical conclusion of an inferior culture in the face of the advance of the West. But what Loti sketched and wrote was much more than just that. He probably witnessed, and was part of, the transformation from subject to object, from inhabitants and bearers of a culture to those who lived in the place where an ancient and forgotten culture became the object of archaeological studies. There are somethings in life that only a few get to experience: they are in the right place at the right time, they have the tools to describe what is going on, they are young, intelligent, and additionally they get paid to do it. This is what happened to Louis Julien Marie Viaud (1850–1923) before he even dreamt of his later pseudonym as Pierre Loti, when he was twenty-two years old (Loti 1872). He enlisted in the French navy, where he pursued a military career, parallel to his passion for writing, which led him to become one of the most famous French romantic writers. He had lived with his family in Oceania and during his initial trip around the world on the frigate La Flore he was lucky enough to have as part of his Pacific itinerary a stop at Easter Island (Rapa Nui). Here he spent four days taking notes, sketching, observing and acquiring mementos to take with him. He had arranged for his family to send copies of his letters to magazines all over the world to be published so that even before he arrived in the rest of the world outside of the Pacific region, he had consolidated his image as a traveller to exotic lands. Among the many objects he took from Rapa Nui, he obtained for his Admiral the head of a huge stone carving, that is now in the Louvre in Paris. It seems to have been an ambivalent act of plunder for Loti, the result of both admiration for the island’s art and pity for the inferiority of its inhabitants (known as Rapanui). Some modern authors consider him to be an Orientalist, as defined by Said (1978; Hargreaves 1981), others believe he was anti-imperialistic in his attitudes (Berrong 2012). Loti thought he was deceiving the locals when he exchanged valuable works of art for objects that were of little value to him, describing it as exchanging ‘a rabbit for a pin’. He obviously knew the value of what he saw in terms of art because he had a solid and well-formed cultural background. And so did his commander, Admiral de Lepelin, who did all he could to obtain artefacts from the inhabitants of Rapa Nui, and to get the massive stone head from a statue on board the ship and to the Louvre in Paris. And Loti, when sketching the removal of the head, added the imaginary toppling of a group of great statues, surrounded by dancing local inhabitants, provided us with one of the best nineteenth century images of the destruction of the monuments of other cultures by the agents of Western civilization, whether the details in his depiction were real or imaginary. 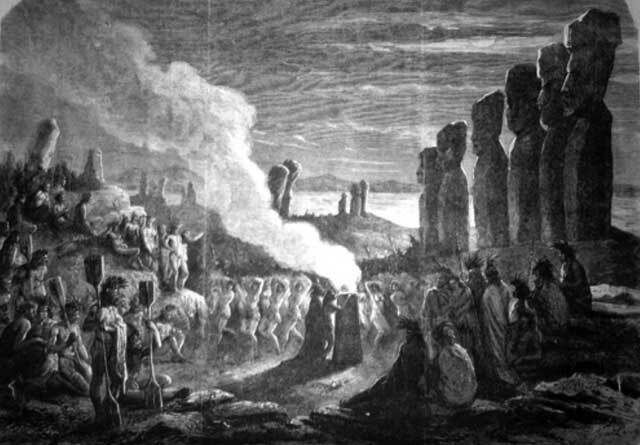 We believe that the drawings are possibly imaginary since Loti sketched two in sequence: the first one in which the inhabitants perform a ritual dance among the many standing statues as if that was significant (see Figure 1); and then the second, the scene of the destruction of a stone sculpture with a concealed European-looking army in the background (see Figure 2). But we actually know they are imaginary because archaeological work demonstrates that by the time of Loti’s visit there was no group of statues still standing on the island. Were Loti’s drawings made to justify the act of plunder that caused him moral qualms, or were they only intended to produce a stronger visual effect? Did he want to depict violence in the armed raid? Was it a symbolic gesture? Today, it is the only image we have of representatives of Western civilization destroying the Easter Island stone carvings, and it is impressive. Engraving of Pierre Loti’s sketch made in Paris in 1872 (Loti 1872, 1025: 72). Engraving of Pierre Loti’s sketch made in Paris in 1872 (Loti 1872, 1026: 180). Figure 2 comprises a massed, frenzied, native dance while the sculptures are brought down one by one; European armed forces are in the background; and an anguished looking but meditating chieftain is portrayed outside of the main action on the left. We know that there were never that many inhabitants on the island, that no massive sculptures were still standing, and that none were actually toppled or broken up or disassembled during Loti’s visit. Loti’s four days of adventures on Rapa Nui had spread around the world, even before he turned up in Paris, via several editions and translations. In time more were published as he continued to enlarge on his diary and the drawings related to the island. It is unfortunate that nobody on board his boat had a photographic camera, not that this would have impinged on the value of the drawings as documents. Both Loti and his brother were photographers (Demariaux and Taboulet 2012). Loti’s visit to Easter Island in 1872 meant several things: on a personal level, it meant his coming out into the world as an excellent artist albeit as a mediocre writer; having experienced a romantic and exotic place, according to the tastes of the time; and having depicted magnificent scenes filled with data and information about that historical moment. Unknown to him, it was the final chapter in the destruction of a civilization. He had seen what others could not, he was there when the people of Easter Island went from being unique in human history, to being slaves, their population decimated and their monuments and material culture nearly totally destroyed or pillaged. The inhabitants of Rapa Nui had reached the brink of extinction, and that is the context in which he drew his sketches (Stambuck 2010). Following the publication of Loti’s first real novel in 1879, which achieved immediate success, Rapa Nui (Easter Island) faded in competition with what was going on in other parts of the world (Blanch 1983a, 1983b; D’Auvergne 1926; Yegenoglu 1998). Loti wrote nothing about the island again until twenty-five years later. From the start of his adventures Loti had recognized the value of exotic experiences. While he admitted to having read previous travel accounts of the island, he had faced the unknown as a true explorer – he was the only one from his ship who had dared to explore the island, as his colleagues believed they were dealing with cannibals. So he incorporated his own fears when constructing his position as a traveller in remote lands in the nineteenth century, with amazement, but with a condescending understanding of the inferiority of the local inhabitants. Thus he saw the ‘unusual beauty’ of the exotic and of the decorative, anticipating his novels, in which the objects of his love would be women in Turkey, Japan and any and all parts of the world far from Western civilization (Tuberfield 2008). But that would be part of his later life as Viaud-Loti, as Chevalier of the French Legion of Honour. We do not know who saw Easter Island for the first time, on behalf of Western civilization, or when it was first seen. We do know that there were travellers, dating back to the seventeenth century, who reported on what was first named ‘Davis Island’, after the English pirate who saw it in 1687. The first description of the island now known as Rapa Nui was written by the Dutch Admiral Jakob Roggeveen in 1722, who christened it after Easter day (Foester 2001). The Dutchman saw the massive stone carvings and provided the first written account about them, but because of a skirmish with the locals caused by the landing of a hundred and fifty belligerent and cautious sailors, the visit did not end well. The Rapanui must have interpreted the situation as an invasion, which was repelled by them, with only two casualties – if we are to believe the Dutch – that ended with the flight of the travellers (Ramírez 2006). However, it seems that European visitation probably caused the epidemics that brought about a massive death rate in the population, leading it to a desperate situation. The arrival of Western civilization cannot have been as innocent as some of the traveller accounts describe, and it brought serious consequences. We do not know if those consequences were added to a longer process of intense ecological degradation. Archaeologists have discussed whether this damage was older and excluded other factors, or whether it existed at all, and whether contact with Western culture came at the same time as an important change in the system of cultivation (Orliac and Orliac 1998; Orliac 2000). The arrival of wooden war ships, and wood was a scarce resource for the Rapanui, along with people coming from places they did not even know existed, must have had a huge impact on them, an impact that had never been considered before: i.e. from their point of view. In time, other voyagers arrived, from James Cook and his crew, who made excellent descriptions of the island and islanders, to passing warships (Palmer 1870), whaling ships and other travellers who wrote or did not write about what they did there for a countless number of reasons. However, the impact on island and islanders generated by huge armed ships with hundreds of sailors on board, with food and uniforms, all the things that the islanders lacked, would have been enormous, and would have created all manner of conflicts. Easter Island had been a remote site which was only important to the Rapanui, with strange and incomprehensible massive sculptures or rock carvings like the ones existing in other parts of the world, but about which nobody knew anything and did not care about either. Today we know that Rapa Nui had an exceptional history which archaeologists had difficulty disentangling and which has generated very interesting debates (Heyerdahl and Ferdon 1961; Van Tilburg 1994; Hunt and Lipo 2011; T. Hunt 2007; B. Hunt 2008; Stevenson and Haoa 2008; Diamond 2005). In the nineteenth century it was considered an oddity, and visitors took with them objects they exchanged for trinkets and there were conflicts only when the landings were hostile. Victorian ethnology had not been born yet (Stocking 1987). If a wooden carving was exchanged for a needle, nobody on board the ship imagined how important the needle (or a nail, or pin) was for local inhabitants. It was not poor trading for the Rapanui or an act of trickery or cheating by the Europeans, as Loti believed. For the Rapanui it was precious because it signified the availability of iron tools, which changed the way they carved, and made wood crafts, which they then sold to, or traded with Europeans. To a great degree, wood-carvings came into being in such a way, through the impact that Western civilization had on the local culture (Kjellgren, Van Tilhburg and Kaeppler 2004). During these years, travellers insisted that they saw human bones and skeletons abandoned everywhere on the island, and this seems to have been true. What we do not know is whether these were bones from looted graves and, if so, who did the looting, or whether the bones belonged to the unburied victims of smallpox. It is possible that herein lies the origin of the myth of cannibalism, although it is also true that the Rapanui used human bones in everyday and ritual activities. But nobody grasped that here were people who were perishing before their very eyes. Another topic for debate is whether the high death rate was their own doing, through the destruction of their own ecology, or whether it was caused by the change to a new agrarian economy, or by the impact of Western culture (Mulrooney, Ladefoged, Stevenson and Haoa 2010) or the combination of all of these factors. In 1805 yet another factor was added to the process of disintegration when the ‘Nancy’, a ship from the United States of America, arrived to get slaves from the Rapanui. There were casualties and twenty-two people were taken away. This event was not forgotten and successive ships were turned away. When the Kaahou-Manou arrived in 1806, followed by the Russians under Admiral Rurich, and the Albatross ten years later, and even Admiral Frederick Beechy and his warship in 1825, contact with the inhabitants was difficult and conflicts erupted in response to the slightest hostility or misunderstanding. Everybody saw a decimated population, stone carvings lying on the ground and a general feeling of almost absolute destruction. It was obviously impossible for anybody to imagine that things had been different, that the fallen statues had belonged to previous times and were the result of changes made in the use of local resources, and of internal political and social and religious changes which caused the stones to be abandoned. Archaeology did not exist. But the hard truth was that on the island in 1868 the crew of the Topaze counted nine hundred people; in 1878 Christian missionaries counted only three hundred, because five hundred had migrated to Tahiti in search of jobs. Another head count in the late 1870s gave a tally of 155 inhabitants. This goes to prove that nobody really knew how many people lived on the island, and that the islanders refused to be counted to avoid being rounded up into concentration camps to work for the new Compañía Explotadora, the first Western capitalist enterprise on the island. Loti arrived at the end of this period of depopulation, which means that the crowds of people dancing in his sketches could not have existed. The history of the decade between arrival of Christianity and the first capitalist venture of raising cattle has already been dealt with, although the degree of responsibility each had in the destruction of the population is not clear (Cristino and Fuentes 2011). Regarding the existence of fallen or toppled statues, at that time it was difficult to envisage that all cultures co-existed and co-exist with the ruins of previous ones (Stanton and Magnoni 2008) – including in Europe – and that the Moais (as the great sculptures were called by the Rapanui) could have been produced at different times with different meanings, and the fact that they were standing or fallen did not necessarily mean destruction, it could also be abandonment, an effect of cultural change (Martinsson-Wallin 1994). It is clear from the study of the processes of sedimentation that some Moais were abandoned and were covered by soil while others were erected beside them (Lipo and Hunt 2005). The chronology and relationship between the two is unknown but the sequence is clear (Heyerdahl and Ferdon 1961). Easter Island’s ordeal began between 1859 and 1861 when ships from Peru took hundreds of its people away as slaves. They were supposedly looking for ‘free labourers’ to work on the guano islands and the mainland of Peru, but it was a ploy to entrap them. If there was to be an end to this isolated world, this was it. What happened from the first contact with Europeans up until then is open to discussion and speculation as to how we interpret the written records left by travellers or to what conclusions archaeology can provide. What is true is that it is too late now to know what exactly happened between the eighteenth and the nineteenth centuries on the island. There was total impunity to loot, kidnap and destroy because the island only belonged to the Rapanui and, therefore, they did not even have anybody to complain to. Massive abductions were only stopped through the work of religious orders and the European embassies in Chile and Peru in 1862. But the price of this intervention was a change in religion, customs, clothing, a slow loss of the native language, and a re-writing of their collective memory by monks and priests (Fuentes 2011; Fischer 2005). In 1864 a mission led by the priest Eugene Eyraud was set up on the island. It was certainly not an easy task but it overturned the history of Easter Island again with the introduction of a religion which involved the destruction of idols and the burning of inscribed tablets. Thenceforth, births, deaths, marriages, education and culture would go through the hands of the new most important man on the island, the director of the Compañía Explotadora, which owned eighty per cent of the land, and who was protected by armed men. It was during these years that the religious representatives, who were not interested in the conservation of the islands monuments of the past, sent several tablets with inscriptions on them to the Bishop of Tahiti, who gave orders that they should be recovered, and who started a collection of such objects. This is the best example of how the everyday objects of a people, depleted in numbers and suffering but alive, were transformed into museum or archaeological pieces. In 1868 the first whole Moai was taken to London (Van Tilburg 2008) and four years later Loti and his Admiral took another one to the Louvre in Paris. Everybody wanted inscribed tablets or at least a wooden carving, and so Rapanui tablets and carvings became collection artefacts, objects of study in museums that were keenly in demand: they had become relics of the past after going through a period when they were considered diabolic writings of the present (Fischer 1997, 2005). The local inhabitants were no longer subjects of study for travellers to describe their exotic activities. They were inhabitants of an island whose culture was the product of other islanders, from the unknown past, nobody knew whom. Rapanui culture had turned archaeological. Loti included the translation of an inscribed tablet, half-way between strange hieroglyphics and something that might be still read. Before rival international hunger for monuments and inscribed tablets that pitted collectors against each other, and local economic and religious interests, and South American independence and nationalist conflicts, Lieutenant Viaud arrived, almost unconscious of any problems. Thus, the future Loti stood before the monuments of what he considered to be the most exotic, strange, romantic and unknown place in the world. He had the ability to write and sketch what the general public appreciated, thus leading to his success. He was in the right place, at the right time, with the biased viewpoint – any conflicts belonged to others – and then there were also, strange women and unknown tongues and the massive monuments of some lost empire. These were ideal contents to be absorbed by the new literate masses of the nineteenth century. And anthropology and scientific archaeology, or at least what was considered then as such, had not yet arrived on the island. We know that history is often not objective but it is striking that the island’s destruction should be attributed by historians only to the slavers, who happened to come from Peru, the very same country at war with Chile (and who would later take political control of the island) between 1879 and 1883. This interpretation leaves aside the impact of previous slaving ships, and all the other events, including deaths caused by diseases. It meant that a single culprit could be installed into local collective memory: Peru, it was to blame for everything. This history was made – or at least forced to become – a justification for the present. It turned important events into minor topics: the Compañía Exploradora hired by the government of Chile did not allow the Rapanui to raise animals; the company forced the remaining islanders to live in a concentration camp up until 1964; the island was militarized; leprosy victims (another disease which wreaked havoc on the island) lacked any doctors treat to them; the use of native language was persecuted; and in the twentieth century local inhabitants hid from authorities by living in caves (Stambuk 2010). It is noteworthy that this version of history is still prevalent. In 1878 Alphonse Pinart, who worked for the Trocadero Museum in Paris, visited Rapa Nui and gathered a collection of artefacts, and published an account of both (Pinart 1878; Parmenter 1966). Adolph Bastian appointed a lieutenant to write observations for the Berlin Museum (Koepping 1983). Rapa Nui continued to be visited by travellers, collectors and ethnologists (Philippi 1873). Rapa Nui was regarded as place that was in Western eyes, Terra Nullius, i.e. land that did not belong to any world power (Cristino and Fuentes 2011; Moreno Pakarati 2012). A few years after Christian missionaries arrived, there were lengthy struggles for power between Brother Eyraud and the company’s employees, which caused another migration of some of the local population to the Gambier Islands. Thus, Rapa Nui remained inhabited by about one hundred people, most of them elderly or sick. In 1877 the owner of the company was murdered and the following year a new sheep raising enterprise on the island began. Although history speaks more benevolently of this new arrival, the peculiar leader of this latest venture was more or less the local king until Chile took over the government of the island in 1888. It appears that Chile’s move to incorporate Rapa Nui was a purchase based on the wrong translation of the text of an agreement that tricked the local inhabitants (Fischer 2005; Delsing 2013). Several travellers, interested in the past of the island, arrived during the following years, and their written records continued to conclude that the massive stone statues were monuments of some ancient but unknown culture. This belief had not changed since Loti’s visit, perhaps the only thing not to have changed since his visit: although the local people spoke their original language and kept their culture, the monuments were regarded as not being theirs, and as belonging to, and made by, another culture who had lived on the island before them. In 1886 William Thomson from the United States of America visited Rapa Nui and in the name of science looted and destroyed everything that remained. He disassembled houses to carry away painted stones, and took hundreds of other artefacts (Thomson 1892) to the point where little remained (years later the United States would return them to the island). His written work and his surveys were well done for their time, and they were the result of the scientific archaeology or ethnography that fattened European collections, and spelled destruction for local artefacts and material culture. When Catherine Routledge arrived in 1914 she encountered about one hundred people living in dire straits and witnessed the first social revolt that forced her to leave (Routledge 1919; Van Tillburg 2003). The bloody Pacific War between Peru, Chile and Bolivia did not affect the island, at least until 1888 when Policarpio Toro arrived on his second voyage and took possession of the island for Chile (Gana 1885, 1904). Today he is remembered as the hero of idealized military history, not as the man who introduced the local concentration camp that lasted for the following eighty years. If Loti had visited even five or ten years later than he had done, he would not have been able to write what he wrote. The archaeology of international museums was born just after his visit (Stocking 1987). Loti’s original sketches of 1872 were engraved in wood that same year and published in Spain, France and Germany simultaneously. Later, although he made other drawings or modified the first ones, he never published them again. His collection is made up of hundreds of drawings published and exhibited everywhere (Quella-Villeger 2010). And then, in 1899, in his later years Loti published Reflets sur la sombre route. He included an extensive chapter where he added new anecdotes and descriptions of the artefacts from the island that he had taken with him, and had not written about before (Loti 1899). Or he simply invented and exaggerated what he remembered: it is impossible to know and he had the freedom all writers have to rewrite each and every one of his works. But Loti’s journal of 1872 is unique and important. We do not know what might have happened if Loti had read the report written by his superior, Admiral Lepelin (1872), which was an objective and factual short account, not literary in style, and based on the Chilean Gana’s account of 1870 (Gana 1904), which precluded Loti’s romanticized version. Neither do we know if Lepelin read Loti’s work before handing in his own report, but it seems probable. Today Lepelin’s publication, the outcome of the same journey at the same time, frames Loti’s, complements it and shows different viewpoints of the same events. The text of the Loti’s diary is presented as a true journal. It starts on January 3, when he reflects, while still on board ship, on the island glimpsed in the distance, about which he has been told ‘strange things’ such as: ‘that they might devour us if we venture wildly into it’ (Loti 1872: 155); and that ‘the indigenous race has become extinct and the island is but a great solitude in the midst of the Ocean, guarded by its ancient stone statues’ (Loti 1872: 156). It is here, in the first paragraph about Rapa Nui in his diary, that Loti had already defined how he would view the others: they might be cannibals, but they are extinct, both things at once. Cannibals, solitude and ancient statues: a perfectly exotic combination. On landing on the island Loti encountered a Dane – who was actually from the United States – planting a bed for cultivation on behalf of an international company. Then he was approached by ‘canoes laden with savages’ (Loti 1872: 157). This is an interesting contrast, from a desert island to a living world. Obviously the ‘savages’ are ‘the last remnants of their mysterious race’ (Loti 1872: 155). Several things happened to him that day. Each of the savages on approaching him offered him ‘a shapeless idol’ (Loti 1872: 155) (were they selling him newly-made souvenirs?). He found the chieftain’s hut, entered it and became his friend. On returning to the ship, the commander admired his acquisition and offered his own coat to barter with the chief for another ‘wooden doll’ (Loti 1872: 187). It was possibly much more than a simple wooden carving that he bartered for, since they ended up taking away the head of a stone carving settled between ‘the delightful sand (…) and a sinister background’ (Loti 1872: 190). 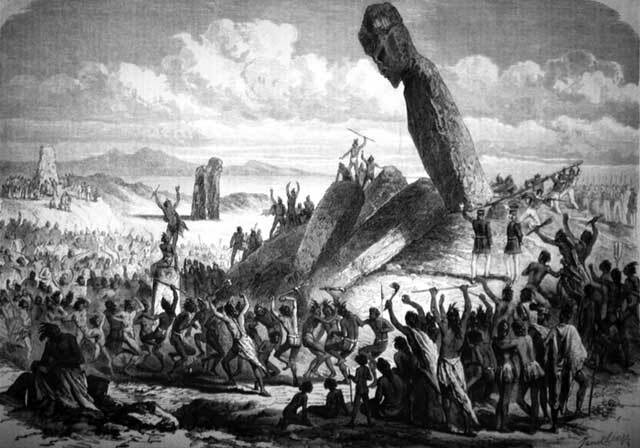 Loti described his second day on the island beginning with the selection of the statue they would carry away with them, and the inhabitants organized a ‘general dance around those stones: they look like a legion of devils’ (Loti 1872: 180). He wrote that ‘the savages, following the example, showed themselves to be as vandalistic as we were’, showing that he was conscious of what he was doing. Loti left us this curious piece of information: ‘the Dane’ collected skulls ‘for the doctor who studies primitive races’ (Loti 1872: 180). There is no doubt that Loti understood what he was destroying, but his categorization was complete: savages, devils and primitive which justified whatever he did. He found out about the visits of slavers and the massacres and he did not justify them but he did not give his opinion either. His attention was drawn to the fact that the inhabitants ‘did not feel any respect for the remains of their ancestors’ (Loti 1872: 157), but he did not act any differently. Assuredly Loti would never have torn down and taken a monument in France. Even if his drawings of the event were imaginary, and if we accept that he only saw empty houses, that he invented his visit to the chieftain, and even if the looted statue had already fallen and was simply carried away, it doesn’t matter, such changes are not so great. What matters is what he wrote and what he sketched. One of his best drawings is a group of five Moais on a platform, wearing their lava hats. By showing it as reality, he lied. But if we view it as a reconstruction of what it used to be, it is excellent. On leaving Rapa Nui, with a tinge of sadness, Loti accepted that it was impossible to stay ‘since there is no way of knowing the degree to which can be exalted the fierceness of a savage, tame and docile by custom, when he is excited by some unknown passion towards civilized men’ (Loti 1872: 190). And he finished his diary by predicting the future of the solitary European inhabitant and skull collector, that when they searched for him ‘they would simply say that Adam Schmitt has died’ (Loti 1872: 190). And in that manner Loti closed the circle going from civilization to savagery. Loti’s diary and drawings are the exceptional and historical proof of the way the West viewed the rest of the world and of its actions in the nineteenth century. If what he wrote and drew is true, it is sad. But if it is fiction, it is interesting because he succeeded in capturing what society in his time needed to see (Farrere 1948). Telling the world that the giant statues were not flat on the ground for ages – at least some of them – but that he himself destroyed them was no minor feat to take responsibility for. Not seeing that he was observing a dying, looted, enslaved people who sold what they had to survive – fake or antique – is pathetic. When Loti assigned great antiquity to the massive stone statues of Rapa Nui, following in the steps of previous writers, and separated these monuments from the contemporary indigenous local people, he gave rise to modern archaeology. But he did not do it without some guilt: in Figure 2, the engraving of the celebration and the destruction of the statues, there is a chieftain sitting apart among the stones: he is distressed, melancholy and sad. 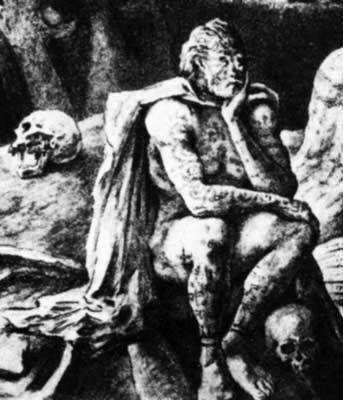 This detail is also repeated in a later drawing which he gave to Sarah Bernhardt as a gift: unrecognizable sculptures are lying on the ground amidst fleshless skulls, and the meditating chieftain is the central figure (see Figure 3). Is it romantic and sentimental nostalgia? Or is it an expression of his own doubts? We do not know what he would have thought if he was told today that the objects of great antiquity that he traded for a pin were modern and made for tourists (Kjellgren, Van Tilhburg and Kaeppler 2004). Loti’s text ends: ‘when I boarded (…) with the idol, my five friends kept still until I was lost from their sight. The old chieftain who accompanied me slowly returned to his hut and, seeing how ridiculous and pitiful he looked with his Admiral’s frock coat and his long tattooed legs, I feel I have been disrespectful, and accept that in the exchange I have committed against him an act of stupid barbarism’ (Loti 1872: 189). Today, Loti’s images and text bear a different dimension from the one they had in his time. It is not that we reproach him now for being part of the imperial debacle brought upon Oceania by Western culture. He was only one of the many who destroyed and pillaged what they could, because they regarded archaeological artefacts belonging to primitive people, as having no owners. Ethnography was the ‘invention of otherness’ and required the construction of an ancient and misunderstood culture, and the separation of goods from their owners. Romanticism was used to see – and show – the sublime, the sinister, the savage, the bestial elements, an excess to the point of stunning the senses, with the purpose of turning into exotic what there was no other way to dehumanize (Evans 2004). Loti’s drawings, unlike those of his predecessors and followers, were the best images of the island, not only for their quality in the Western sense of art (Farrere 1948; Quella-Velleger 2010), but also because he managed to see what he had to see and draw what he had to draw, in the precise place and at the right time. Berrong, R M (2012). Pierre Loti the Anti-Colonialist: Pêcheur d’Islande In: Cincinnati Romance Review. Cinncinati: Kent State University, 34pp. 34–46. Blanch, L (1983a). Pierre Loti: Portrait of an Escapist. London: Collins. Blanch, L (1983b). Pierre Loti: The Legendary Romantic. San Diego: Harcourt Brace Jovanovich. Cristino, C and Fuentes, M eds. (2011). La Compañía Explotadora de la Isla de Pascua: patrimonio, memoria e identidad en Rapa Nui. Santiago: Ediciones Escaparate. D’Auvergne, E B (1926). Pierre Loti: The Romance of a Great Writer. New York: Frederick A. Stokes Company. Delsing, R (2013). Kaina, Rapanui, antecedentes antropológicos e históricos In: Fuentes, Miguel (ed. ), Rapa Nui y La Compañía Explotadora (1895–1953). Santiago: Rapa Nui Press y Consejo Nacional para la Cultura y las Artes, pp. 329–343. Demariaux, J C and Taboulet, G (2012). Pierre Loti Photographe. Paris: Editions du Scorpion. Diamond, J (2005). Collapse: How Societies Choose to Fail or Survive. New York: Viking Press. Evans, R T (2004). Romancing the Maya, Mexican Antiquity in the American Imagination 1820–1915. Austin: University of Texas Press. Farrere, C (1948). Cent dessins de Pierre Loti, l´influence sur les artistes occidentales. Tours: Arrault. Fischer, S R (1997). Rongorongo, The Easter Island Script: History, Traditions, Texts. Oxford: Clarendon Press. 14 Oxford Studies in Anthropological Linguistics. Fischer, S R (2005). Island at the End of the World: The Turbulent History of Easter Island. London: Reaktion Books. Foester, R (2001). Rapa Nui, Las primeras expediciones europeas. Rapa Nui: Rapa Nui Press. Fuentes, M ed. (2011). Estado y Compañía Explotadora. Apuntes para una caracterización del poder colonial en Rapa Nui (1917–1936). Santiago: Tiempo Histórico N° 3. Gana, I (1885). Descripción científica de la Isla de Pascua, Revista de la Marina Valparaíso: 1: 368–460. Gana, I (1904). Memoria que el Ministro de Estado en el Departamento de Marina presenta a1 Congreso Nacional de 1870, Santiago: : 90–110. Hargreaves, A G (1981). The Colonial Experience in French Literature. London: Macmillan. Heyerdahl, T and Ferdon, E eds. (1961). Reports of the Norwegian Archaeological Expedition to Easter Island and the East Pacific, Archaeology of Easter Island. Monographs of the School of American Research and the Museum of New Mexico. 24 part 1. Hunt, B (2008). Inventing Easter Island. Toronto: University of Toronto Press. Hunt, T and Lipo, C (2011). The Statues that Walked: Unraveling the Mystery of Easter Island. New York: The Free Press. Kjellgren, E, Van Tilhburg, J A and Kaeppler, A L (2004). Splendid Isolation: Art of the Easter Island. New York: Metropolitan Museum. Koepping, K P (1983). Adolf Bastian and the Psychic Unity of Mankind: The Foundations of Anthropology in Nineteenth Century Germany. Santa Lucia: University of Queensland Press. de Lepelin, T (1872). Visite du Contre-admiral de Lapelin à l´isle de Paques (Rapa-Nui) In: Revue maritime et colonial. Paris: Ministiere de Marine et des Colonies, 35pp. 105–125. 526–544. Reprinted in: Bulletin de la Société d’anthropologie 8: 436–531. Lipo, C and Hunt, T L (2005). Mapping Prehistoric Statue Roads on Easter Island. Antiquity 79: 158–168. Loti, P (Julian Viaud) . (1872). Viajes: La isla de Pascua, diario de un oficial del Estado Mayor de La Flore, El Correo Ultramar 1025: 155–158; 1026: 179–181; 1027: 187–190 In: Barcelona: Globus, XXIIIpp. 65–68. 81–84, Braunschweig, 1873. Loti, P (Julian Viaud) . (1899). Reflets sur la sombre route. Paris: Calman-Levy (eds), 49a. Edition pp. 231–338. (1926). Moreno Pakarati, C (2012). La importancia de la arqueología histórica en Rapa Nui: el caso de la explotación ovejera y la domesticación del poder colonial In: Fuentes, M. ed. Rapa Nui y la Compañía Explotadora. Valparaíso: Consejo Nacional de la Cultura y las Artes, pp. 284–293. Mulrooney, M, Ladefoged, T, Stevenson, Ch and Haoa, S (2010). Empirical Assesment of Pre-European Societal Collapse on Rapa Nui (Easter Island) In: Wallin, P. and Martinsson-Wallin, H. eds. The Gotland Papers. Gotland: Gotland University Press, 11pp. 141–153. Orliac, C (2000). The Woody Vegetation of Easter Island Between the Early 14th to the Mid-17th Centuries A.D. In: Stevenson, C. and Ayres, W. S. eds. Research on Early Rapa Nui Culture. Los Osos: Easter Island Foundation, pp. 211–220. Orliac, C and Orliac, M (1998). The Disappearance of Easter Island’s Forest: Over-exploitation or Climatic Catastrophe In: Stevenson, C. M., Lee, G. and Morin, F. J. eds. Easter Island in Pacific Context, South Seas Symposium, Proceedings of the Fourth International Conference on Easter Island and East Polynesia. Los OsosEaster Island Foundation, Cloud Mountain Press: 129–134. Parmenter, R (1966). Explorer, Linguist, and Ethnologist: A Descriptive Bibliography of the Published Works of Alphonse Louis Pinart, with Notes on His Life. Los Angeles: Southwest Museum. Philippi, R (1873). La isla de Pascua y sus habitantes. Santiago: Imprenta Nacional. Pinart, A (1878). Voyage à l’île de Pâques In: Le Tour du monde, Nouveau Journal des Voyages Paris: XXXVI: 225–240. Quella-Villeger, A (2010). Pierre Loti dessinateur. Paris: B. Mercier. Ramírez, J M (2006). Cronología y Fuentes de la historia Rapanui: 1722–1966. Archivum, Revista del Archivo Histórico Patrimonial de Viña del Mar VI(7): 185–209. Routledge, K (1919). The Mystery of Easter Island. London: Hazell, Watson & Viney. Said, E (1978). Orientalism. New York: Pantheon. Stambuk, P (2010). Rongo, la historia oculta de la Isla de Pascua. Santiago: Pehuén. Stanton, T and Magnoni, A eds. (2008). Ruins of the Past: The Use and Perception of Abandoned Structures in the Maya Lowland. Boulder: University Press of Colorado. Stevenson, C and Haoa, S (2008). Prehistoric Rapa Nui. Landscape and Settlement at Hanga Ho’onu. Los Osos: Easter Island Foundation. Stocking, G W (1987). Victorian Anthropology. New York: The Free Press. Thomson, W (1892). Te Pito te Henua, or Easter Island. Washington: Smithsonian Institution. Tuberfield, P J (2008). Pierre Loti and the Theatricality of Desire. Amsterdam: Rodopi. Van Tilburg, J A (1994). Easter Island Archaeology, Ecology and Culture. London: British Museum Press. Van Tilburg, J A (2003). Among Stone Giants: The Life of Katherine Routledge and Her Remarkable Expedition to Easter Island. New York: Scribner. Van Tilburg, J A (2008). Remote Possibilities: Hoa Hakananai’a and HMS Topaze on Rapa Nui. London: The British Museum Research Publication, p. 158.